CoCo Vandeweghe and Francesca Schiavone will play the opening match. Bethanie Mattek-Sands and Flavia Pennetta will play the second singles match. Liezel Huber and Melanie Oudin will play doubles for the U.S.
CoCo Vandeweghe with Clyde the sea lion. SAN DIEGO, Calif. - CoCo Vandeweghe was selected to play in her first-ever Fed Cup match, Bethanie Mattek-Sands lost her wedding ring in a dolphin tank at Sea World and a sea lion named Clyde selected the order of play for the weekend. In short, it was one of the most entertaining and eventful Fed Cup draw ceremonies for the U.S. Fed Cup Team in recent memory. 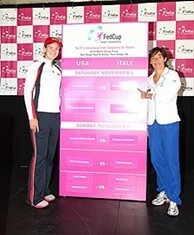 The official draw ceremony for the 2010 Fed Cup Final between the U.S. and Italy was held at Sea World in San Diego, where U.S. Fed Cup Captain Mary Joe Fernandez nominated Bethanie Mattek-Sands as the team’s No. 1 singles player and Fed Cup rookie CoCo Vandeweghe as her No. 2 singles player. Liezel Huber and Melanie Oudin were selected as the U.S. doubles team. Sea World trainers escorted Clyde to the podium in a cart to select the order of play for the weekend. When presented with a bowl of tennis balls – each containing one of the names of the nominated singles players – Clyde reached in and with his mouth picked up the ball containing Vandeweghe’s name. It meant that Vandeweghe, 18, will open play Saturday against 2010 French Open champion and world No. 7 Francesca Schiavone, Italy’s No. 1 player, in the first match. Mattek-Sands then faces Italy’s No. 2 player, Flavia Pennetta, in the second singles rubber on an indoor hardcourt at the San Diego Sports Arena. On Sunday, Mattek-Sands and Schiavone meet in the third singles rubber, and then Vandeweghe and Pennetta play fourth singles followed by the doubles rubber between Huber and Oudin and Sara Errani and Roberta Vinci. The U.S. is trying to win its first Fed Cup title since 2000. "I’m really excited to represent my country tomorrow. That it’s in a final, it’s a great accomplishment. Just to know that Mary Joe and my teammates think that I can beat Francesca tomorrow is great motivation for me," Vandeweghe, ranked No. 114, said. "We’re going to discuss a game plan of how to play Francesca tomorrow, what kind of suits my game style against her game style, implement my game style to the best of my ability. That’s what Mary Joe and I discussed last night." "That sea lion experience is something I’ll never forget," she added of the draw. In deciding to select Vandeweghe to make her Fed Cup debut, Fernandez liked the matchup of her 6’1" frame and power game, featuring a big serve, against the more petite and feisty Schiavone. "Basically we had three singles players that could play. We took a lot into consideration: the surface, the opponents. We knew that Schiavone being No. 1 would play our No. 2," Fernandez said. "Yesterday, after a day of practice, after picking Bethanie to play, knowing she was our highest ranked, we knew she would play at the end of the first day. (Schiavone) is such a different style of player than I think the players are accustomed to. (We) decided (to go) with CoCo. With her height, her serve, her ability to really hit the ball up here, that’s a good choice to start the day." Vandeweghe is the first player to make her U.S. Fed Cup team debut in a final since Chanda Rubin in the 1995 final against Spain. Although Vandeweghe does have Fed Cup experience, having traveled with the team as a practice partner two previous times. "I'm going to be excited for when Bethanie is out there playing, when Melanie is out there playing, when Liezel is (playing) in doubles," she added. "I’m here to be a team player. That’s the great thing about Fed Cup, is the team environment. We’re all here supporting each other." Fernandez had the option of either Oudin, who has played in six straight ties on the U.S. Fed Cup Team, or Vandeweghe for the second singles spot behind Mattek-Sands, who is the team’s highest ranked singles player at No. 58. In last year’s final against Italy (which the Italians won 4-0), Pennetta and Oudin were the No.1 players and if Pennetta was playing the opening match again this year, Oudin would probably been selected instead of Vandeweghe. But with Schiavone playing first, Fernandez went with 18-year-old, who is from nearby Rancho Santa Fe, Calif. and will have a lot of family in attendance. Fernandez and Italian Fed Cup Captain Corrado Barazzutti do have the option of changing their lineups on match days and between each match. "Had it (Schiavone-Pennetta) been reversed, Melanie probably would have started against Pennetta because she matches up very well against her," Fernandez said. "So it was really a matchup decision. So very easily we could switch (singles players on Sunday). Melanie could play the big match. Melanie has been my MVP of Fed Cup really. She’s ready. Everybody is ready. Everybody knows that day one anybody can play. So it’s a team effort." It will be the first-ever meeting between Vandeweghe and Schiavone and on Sunday it will be the first meeting between Schiavone and Mattek-Sands. The selection of Vandeweghe, as a Fed Cup rookie, instead of Oudin in the second singles spot was a bit surprising to the Italian team, but Schiavone knows Vandeweghe has had some great results this year. "I am a little bit surprised because I know all the balance from one player to the other one. I think she's young, she's growing up," Schiavone said. "She play very good this year. The captain has the chance to study her a little bit more in Asia. So he know how she play. I have a good opportunity tomorrow to give the best and to try to take this (first) point." The entire U.S. Fed Cup Team had lots of fun at Sea World prior to the draw, as it took pictures with and fed some killer whales and then pet some dolphins with many members of their family and friends around, including former world No. 1 Lindsay Davenport. Trainers showed the players how to get the dolphins to do various tricks, including flapping their hands down, which made the dolphins flap their tails in the water – and spray the entire team to their delight. At one point, Mattek-Sands leaned in rub one of the dolphin’s heads and into the tank went her wedding ring. But she only has tennis to think about this weekend – a trainer leaned in and safely retrieved it for her – and she is feeling great about her game. "We got to see the Orca whales and everything before the Italian team and everyone got there, got up close and personal. The dolphins, got to pet them and everything," Mattek-Sands said. "We were doing hand gestures to make them do tricks. We did one where you’re supposed to turn around and scare them. I do it, and my wedding ring falls off in the pool. Thankfully the trainers got in and got it out and everything is okay. So it’s going in my pocket next time. "I’m really feeling confident in my game," she added. "I ended my season really well. I think I improved a lot this year and I’m feeling good."